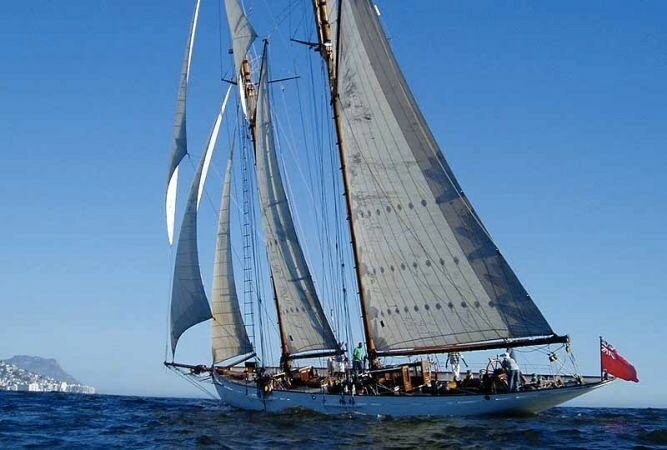 She was designed by Fred Shepherd and constructed by White Brothers of Southampton in 1902 for an Irish Doctor. At this time Ireland was still a part of the U.K.. Despite being designed a quarter of a century earlier as a cruising boat Coral had notable racing successes in the 1920’s as a gaff yawl. She won the King’s Cup in Both 1926 and 1928 and in those days our King George V, like your King today, was a keen yachtsman. Coral’s success was a nuisance and the following year the Royal Yacht Squadron changed the rules of the King’s Cup excluding ‘small’ yachts such as Coral. Coral was shipped to South Africa in 1990 for a rebuild. This was finished in 2006. Her owner then sailed her to the Caribbean where I found her with a broken boom and peeling varnish. We fitted her up and sailed her home to Cowes. On June 1st this year we won the Jubilee Cup and the Shamrock Trophy in the Round the Island Race which is Europe’s most popular yacht race attracting 1500 entries.